People start off the new year with all sort of resolutions, but rarely achieve their goals. If you’re in a situation where you need to sell your house quickly in Pueblo, we can help you achieve at least one goal for 2018. Selling a house can be a time-consuming, stressful and frustrating experience and while sometimes the outcome is rosy, it can also leave you feeling as if you spent a lot of time and effort and didn’t get the result that you really wanted. And while going the traditional route is one way to proceed, there are other options for selling your home. People have been buying and selling homes for millennia—even the pharaohs saw the benefit of upgrading. And though those guys had to go through the traditional channels, that doesn’t mean that you have to. After all, selling your home through the traditional channels can be costly and time-consuming. You have to find a realtor, go through their process, follow up with them to make sure that they’re putting in the effort to get your home sold, deal with showings and more. Then, to top it all off, you have to pay the agent’s fees and commissions. That’s not even taking into account the cost of any repairs you may need in order to sell. You could go the online route—more people are trying this option as it cuts out the realtor’s fees. However, the amount of time that it could take for you to list it, arrange for showings, deal with negotiations and go through the closing paperwork can still be months if not years. If time is of the essence, then this, too, is not a great option. If you need to sell your home quickly, get a fair price and don’t want to deal with a lot of hassle, then consider selling your home to a professional home buyer, like the team at I Buy Pueblo Houses. I’m in the business of buying houses: That’s what I do. As a result, there’s no need to undergo costly repairs before selling, no need to list your house with a realtor and I usually pay the closing costs and fees. It’s fast, easy and, best of all, you’ll get a fair price and peace of mind. If you’re perfectly happy in your current home, then there’s no need to keep reading. We can talk in the future. However, if you’re facing a personal situation like divorce or a relocation, or a financial issue like pending foreclosure or are upside down on your mortgage, then selling your house is one of the best ways to solve this situation. We buy houses quickly: we’ll offer you a fair and honest price and we pay cash. We’ll even pay most, if not all, of the closing costs. Perhaps you’re in a house you can no longer afford, are making two house payments, you inherited an unwanted property or own a vacant house. We’ll make you a fair cash offer and you can get on with your future—fast. Just imagine what you could do if you weren’t making payments on a house that you no longer want. If you’re ready to sell your house fast, contact us at I Buy Pueblo Houses. It doesn’t matter what shape it’s in or how quickly you need to sell. We can take care of the details and you can receive a cash offer: you’ll be ready to move on with your life. 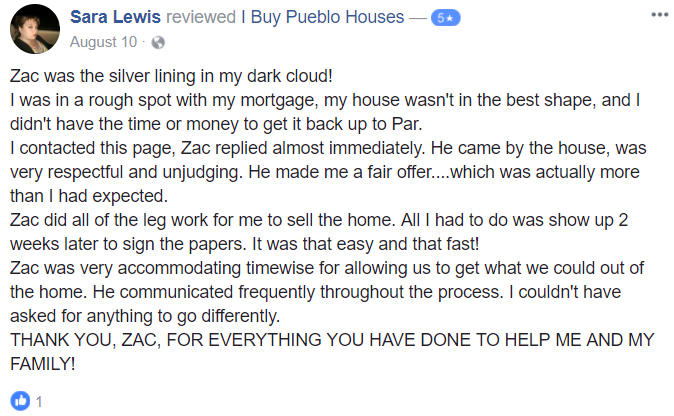 At I Buy Pueblo Houses, we love helping sellers sell their house faster, easier and for no fees. We’ve been in the area for 9 years and we know how this area works and how to get you a fair and honest price for your house. If you want to learn more about our service and how we can help you, connect with us by calling 719-299-0741 or by filling out our online form. We’ll contact you within 24 hours. So check off at least one resolution this new year and sell your house fast in pueblo today.